Earlier today(November 20th) in New York, Millie Bobby Brown was on hand to light the Empire State Building for World Children's Day. When it comes to Millie's style, it can either be a bit too mature or fun. On this occasion, I find that her ALTUZARRA SPRING 2018 blue gingham shirt dress is bit on the mature side. I like it, along with her black mules but it just doesn't suit her. I think if this was shorter, to the knees and styled with sneakers, the results would have been different. She finished up with a side parted straight bob and a blue manicure. 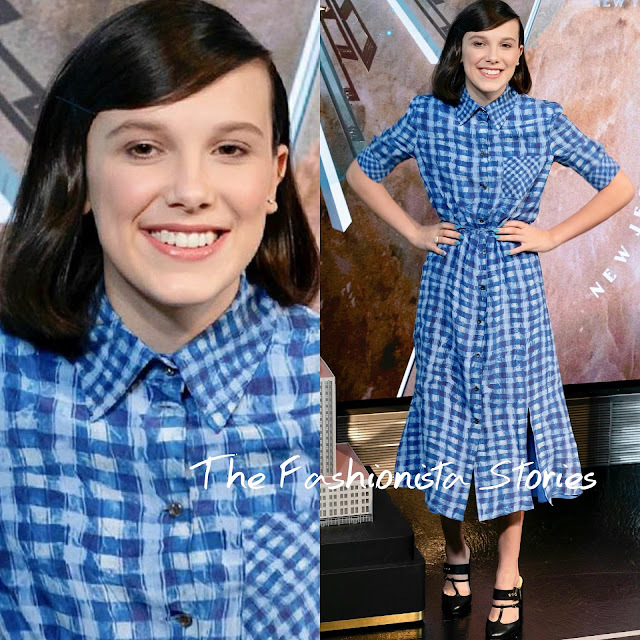 What do you think of Millie's look? Hi, unfortunately Millie's dress is for Spring 2019.